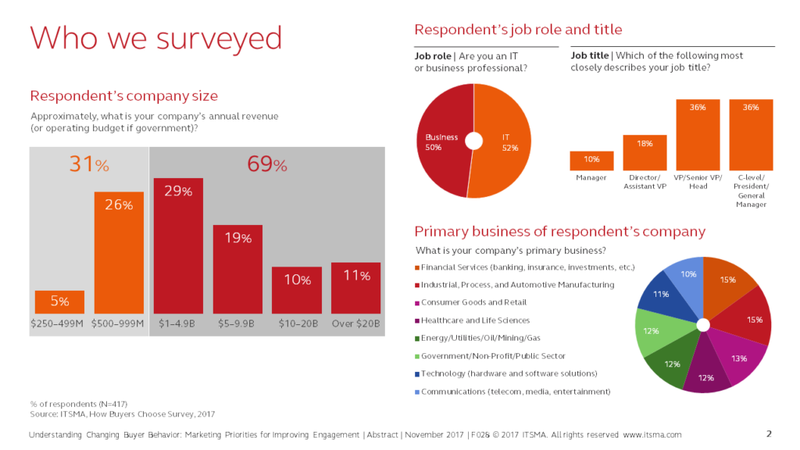 In the connected economy, B2B buyers want to engage with companies that provide highly-tailored ideas and information oriented to their specific business, industry, role, and situation. In response to rising expectations, B2B marketers are moving as fast as possible to integrate the data, tools, and processes required to market to segments of one. As marketing organizations transform for the digital future, however, there remains a gap between near-term potential and current reality. 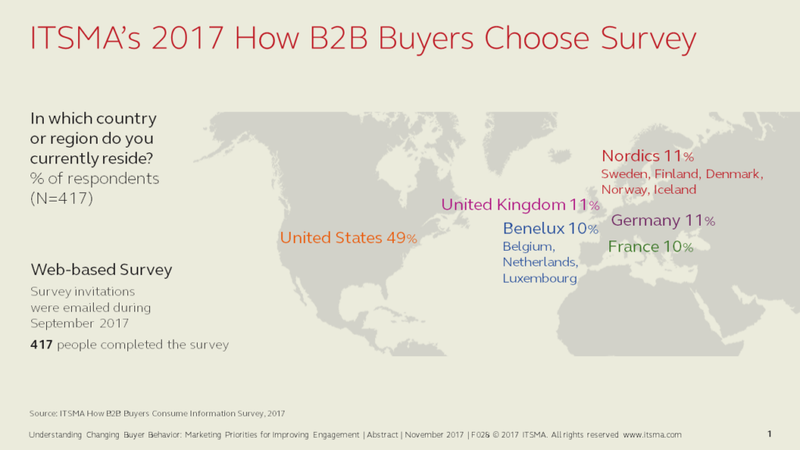 ITSMA’s annual How Buyers Choose research explores B2B buyer preferences for content and engagement with providers of business and technology services and solutions. Based on an extensive survey with more than 400 buyers of high-value solutions, this report provides essential data and insight on the challenges and opportunities that marketers face to improve engagement. Specifically, the report covers buyer preferences for content and engagement at every stage of the customer lifecycle from initial solution research through post-sale and post-implementation review. Data include the most important types of information at each stage, preferred delivery channels, and key decision criteria. As marketers look to improve engagement with current and potential buyers, they must accelerate investments in customer and market insight to enable increasingly tailored marketing based on priority topics and tactics for each buyer and account. The 4 P’s provide important guidance to support those investments and a more effective approach. In Fall 2017, ITSMA conducted a web survey of 417 business and IT executives from companies that purchase technology or consulting solutions for individual contracts over $500,000. These respondents represented larger enterprises, with 69% having $1 billion or more in annual revenue from seven different countries: United States, United Kingdom, France, Germany, Nordics, and Benelux.